Explore why PMI-PBA® is must have certificate for you? What is the best way to get into the preparation of PMI-PBA®? What should be included in the course to get my certificate faster? How can I gain and maintain my PMI-PBA® certificate? What all needed to fill in the PMI-PBA® exam application? – If you are facing high time to understand answers to such questions, this is must have course for you. PMI-PBA® is an evident proof of your hands-on experience, skills, and effective business analysis. It shows your critical competency which includes defining requirements; work with stakeholders to realize product vision to drive business outcomes. And, your exam preparation should start on the right foot to maintain a motivation to get it at the shortest possible time. This 7 hours mini-course will give you a familiarity of PMI-PBA® certificate including the quickest path to get it. It will help you to understand the various Business Analysis domains and process groups covered under the Business Analysis Practice Guide, PMI Guide to Business Analysis, and Application process. What will you get from this PMI-PBA® FREE introductory program? How can iZenBridge help you to get your PMI-PBA® faster? Have you heard that referring Business Analysis Practice Guide and PMI Guide to Business Analysis is difficult to interpret with real, everyday, and practical world of Business Analysis? iZenBridge PMI-PBA® course makes it a breeze to understand dry Business Analysis concepts in easy to understand language coupled with a lot of practical examples. This introductory course will answer your queries to move you in the paramount direction of getting your PMI-PBA® dream. 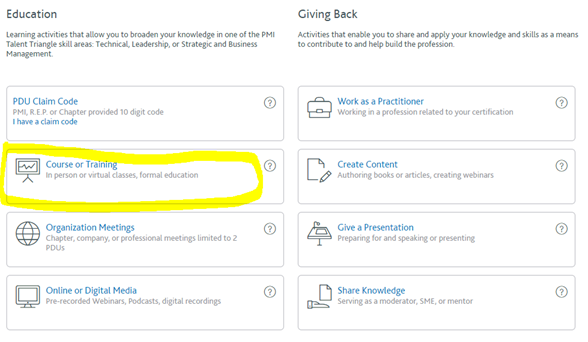 Snap your introduction to PMI-PBA® by simply clicking on the enroll button, and you will be taken to eLearning portal of iZenbridge. Create your account to begin your learning. How to Report PDUs to renew your existing PMI Certificate? You need to provide the course name which is available in PDU claim section of your PMI-PBA® introductory course. As soon as you will fill the name, of course, the other details like course provider, course description, and PDU details will be available from the PMI system automatically. You don’t need to enter these details manually. Can I use these PDUs while filling the PMI-PBA® Application? No, for the PMI-PBA® exam application, you need to report PDUs which are earned alignment of the PMI-PBA® exam content outline. These PDU’s can be used only to renew your existing PMI-PBA® certificate. For PMI-PBA® application, you need to enroll in the course which is specifically designed and approved for it. We have complete course for PMI-PBA® which is approved for required PDus from the PMI.